I have posted this page- as a rough draft - a bit of a grab bag - in the hopes that others may know of other bits of the puzzle and can set me right. I have learned a lot since 2007 - thank goodness - but still have much to learn. August 20, 2015 - I have deleted lots of assumptions that turned out to be flat wrong. The OLIVER family crest: Amy LLOYD - 1874-1962 - a daughter of Sir Thomas JACKSON and grand-daughter of Eliza OLIVER -says that the Oliver crest that relates to our family included the symbol of three fish, one below the other. This is an echo of the KANE family crest, so there may be a connection to the KANE family. 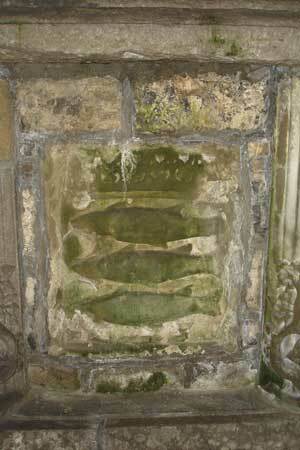 I did find a plaque with the three fish sculpted on the right hand side of the entrance to the Church of Ireland cathedral at Trim. The fact of it had first been mentioned to me by Thomas Andrew Jackson (1830-2007). As a child, attending a funeral, he had overheard one of a couple of exceedingly well-dressed, elderly women saying: Our family have been here. These women were not local, nor were they known to Thomas Andrew Jackson. They were of a higher social class than his farming family. The Trim Cathedral was the church of his parents, and he was a grandson of Eliza Jackson née OLIVER. 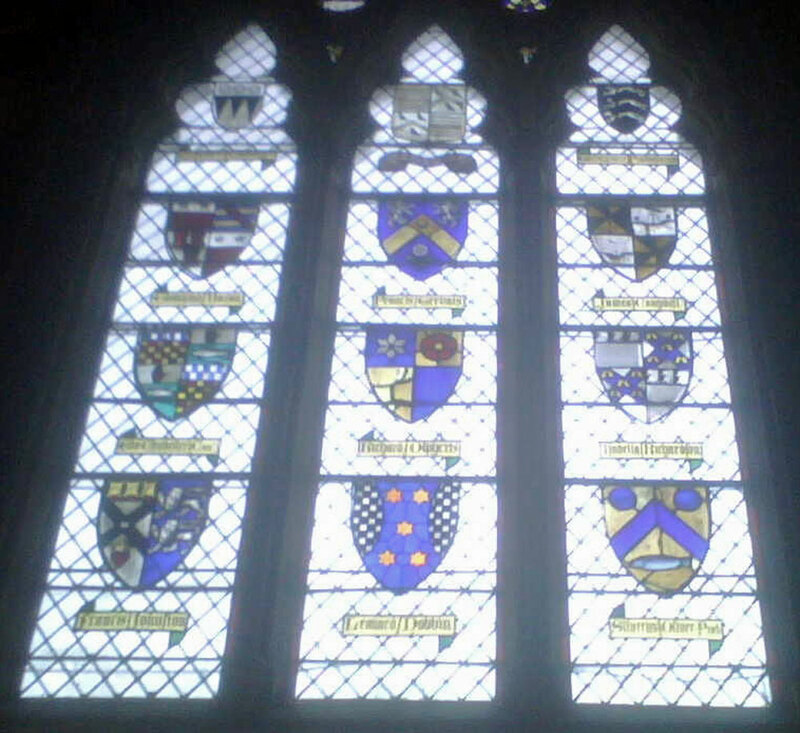 The family crest of the Olivers of Limerick has only one fish, not three and is identical to the Oliver family crest in the Northern Transept of the Church of Ireland Cathedral window in the City of Armagh. This was the crest of Rev Silver OLIVER (1778-1844), rector of Loughgall, Co. Armagh. He was a benefactor during the 1834 restoration of the Cathedral, and was buried at Derrynoose, Co. Armagh. There are some confusions about his connection to the rest of our Oliver family in our family's oral history. I am still working on clarifying all this. I have included a large version of the image so you can see the particulars of the crest of Silver Oliver in the lower right hand corner of the window. The Location of our OLIVERS: Blin BROWN , my great-aunt, left us notes that say: The Olivers came from France originally & settled around Armagh. 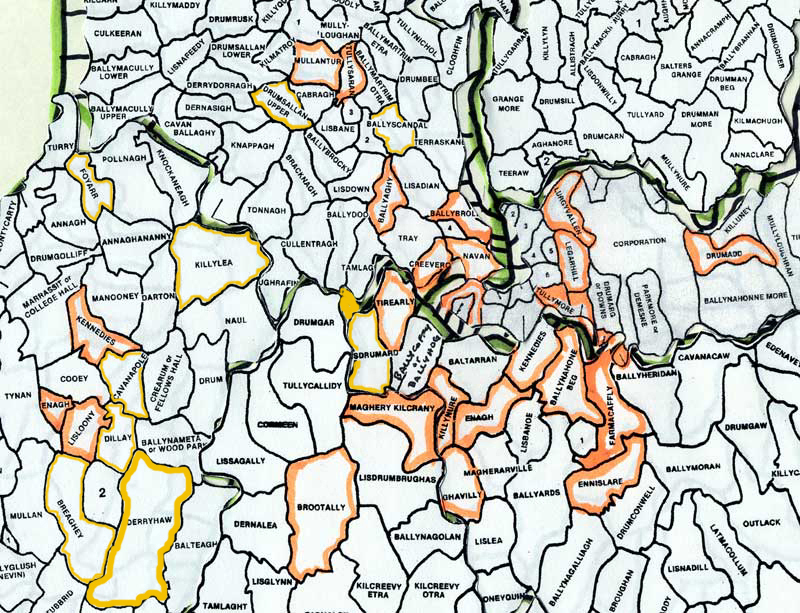 At one time, they owned lots of landed property, Killylea & Lisnadill districts. They had Dublin connections too. These land connections can be traced and verified through the various DEEDS that I have posted and I am continuing to work on the full story of their landholdings. There are still more deeds that I need to view and digest. Blin BROWN also mentioned that the Dublin branch of our family had the cathedral in their crest. I have few ideas who the Dublin OLIVERs were (just a few marriage and birth records) and how they may eventually fit in. Perhaps they were the well dressed ladies who turned up at the funeral in Trim. Silver OLIVER - the mystery of how he connects: Other notes of Blin's from Gilford Castle claim that: Silver Oliver was Dean of Armagh & his son, Silver Oliver married Maria Oliver. Unfortunately, I can find no record of Rev. Silver OLIVER and his wife Alicia MADDEN having any children. Yet. If they did, there was a Silver OLIVER (1778-1844) who may be the one that Blin may have been referring to. He was a Doctor at Loughgall, Co. Armagh. A person so named entered military service, serving mainly in India and Canada. SOURCE: From http://www.whonamedit.com/doctor.cfm/2240.html ] He was described as an English military surgeon, born at Kilfanane, Co. Limerick in 1836 who ended his career as Surgeon General. He was also the author of: Physical diagnosis of thoracic aneurysm. [SOURCE: Letter. Lancet, London, 1878, II: 406.] He died 1908, at Farnborough. NOTE: I am unsure if this is the same person that Blin identified. Then there is also a William Silver OLIVER who is recognized in a Canadian patent: SEE: Patent 45782 . In 1870 he served as a regimental surgeon with the 1st Battalion, 60th Rifles, in the Red River campaign; there he had seen first-hand the combat requirements of soldiers. His goal was to furnish each man with enough ammunition, clothing and rations to make him independent of his base for a 24-hour period. Given the timelines, I suspect that if this OLIVER was related to the previous William Silver OLIVER, then he was likely to have been a son. This one married in Toronto: 16 April, 1872, William Silver OLIVER, Staff Surgeon to H. M. Forces, bachelor, and Elizabeth Alice GALT, spinster, Toronto. [SOURCE: St. James Church, Toronto, Canada ] Interesting in this connection is that there was also a John OLIVER b.1834 who was a Colonel of the Canadian Royal Artillery and also a professor who married a local woman in Kingston, Ontario. I believe he was also a surgeon. SEE: Report 102 . NOTE: I have nothing more on any of these OLIVERs at this time. According to Blin, the OLIVER families are also connected to the DOBBIN family of Armagh. I have been able to nail some of this down. Mary OLIVER (b bef 1691) married a James DOBBIN (1684-1722). She was a daughter of William OLIVER (abt 1670-1726) of Sherranmcaghully, Parish Of Eglish, Co. Armagh or Tattykeel, Parish Of Kildress. His wife was possibly called Elinore (d 1753, Mullinture). From two email correspondents, Michael DOBBIN and Lori CHECHI, I learned more details about the Mary OLIVER who married a James DOBBIN (1684-1722) of Tirnascobe and Rathdrumgran on Dec 6, 1711. They had a son who died in infancy, three daughters and two other sons, William (Baptised Sept 12, 1714) and Rev. James, 1st Presbyterian Minister at Newtownards, Co. Down (Bapt. Feb 26, 1714). [SOURCE: email Feb 8, 2006]. Also, they lived in Tirniscobe, on the Charlemount Estate in Armagh. [SOURCE email: Jan 25, 2005] Mary OLIVER had a brother, William OLIVER, who may also have been from Tirnascobe, Co. Armagh. NOTE to self - follow up on Charlemount records. One other source to tuck in the back of our heads are the Parish records of St. Marks, and St. Patrick's Cathedral in the City of Armagh. In these records, there are three townlands of interest in connection with the DOBBIN name. There are two DOBBIN births (1785 & 1844) with parents resident at Ballinahone (a townland where we have records indicating the presence of OLIVERs from 1770-1849) and in 1820 a William & Eliza DOBBIN had a daughter, Mary Jane born at Ternascobe. In the burials, there are ten DOBBINs whose residences were in townlands close to Killynure, including two who were actually given as resident at Killynure (a child Leonard DOBBIN, died at Killynure in1756 and a child Margaret died at age 6 in 1757). Since Killynure was leased by OLIVERs from at least 1806 onwards (and owned until 1954), this proximity might have also encouraged more intermarriages that we have yet to learn about. In 1766 Bryan Burns of Laragh demised to David Oliver of Ballyrea, C. Armagh, the corn mill called Lough Egish mill. Oliver was already in the linen trade in Co. Armagh. The corn mill seeminigly was changed into a beetling mill. It would appear that the concern got into debt and was 'rescued' by D McTear who in the process received a lien on the property. When David Oliver died, there was some difficulty in settling the estate. In 1815, the Court of Chancery ordered that in consideration of outstanding debts being discharged, McTear should assign the bleaching mill and green, in their actual possession, to Oliver's sons Joseph, William and Benjamin. The bleaching operation was being worked on a reduced scale; part of the mill had been changed into a flax scutching mill and another into a corn mill. It only worked 4 months of the year in total." Initially, I had presumed that David OLIVER's wife was probably a LESLIE, but that was a misreading of the proceedings of an 1845 Court Case held at Ballybay and concerning the mills at Laragh. That being said, the news reports were helpful in identifying some of the likely descendants of this DAVID OLIVER and his wife Susannah WALKER. Also helpful were a range of deed memorials that included likely OLIVERs and townlands. These leases fit with some of the internment records held at St. Marks, City of Armagh. They show a record of a David OLIVER of Ballyrea who was interred Feb 2, 1806. It seems to be a good fit with this David OLIVER since he was definitely alive in 1803 when his daughter Martha was married (that was where the LESLIE came in) but was also obviously dead before 1815 when the Court of Chancery (dealing with his convoluted will and business affairs) ordered his debts settled. There is a record of a will probate in 1807 for a David OLIVER of Ballyrea, but I have yet to see the will - if it still exists. David OLIVER's wife was a Susannah OLIVER of Ballyrea who was interred (likely at St. Patrick's Cathedral) on March 24, 1808. William OLIVER Born before 1804 He died "unchurched" in 1873 at Killynure . 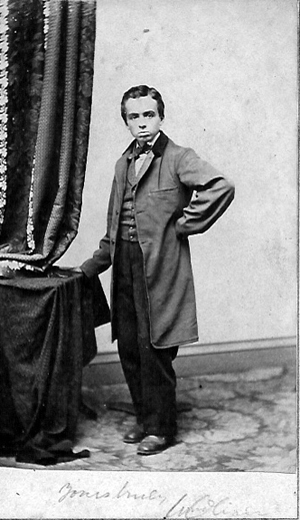 Thomas OLIVER Born before 1813. Never married and died in 1867. He farmed with his brother William. Mary Jane OLIVER Born 1821, died October 3, 1875. Never married. William OLIVER July 27, 1828. There are a number of interesting conjectures about this particular William OLIVER. This photo is in a photo album on the same page as other children of Andrew Bradford OLIVER, so my assumption is that William is one of his children. I cannot be sure whether William's mother was the 1st wife of Andrew Bradford OLIVER, or the 2nd. Update: Recent sleuthing by Carolyn Hendry makes it more likely that William was a child of Andrew Bradford Oliver's 2nd marriage, and that William had a middle initial "H", which may have stood for Hanna. He is recorded on the family gravemarker in Lislea, but based on the fact of an identical death date for a William Oliver, was buried at Fort Leavenworth, Kansas. He served as William H. Oliver, Private, Company A, 1st Regiment, Kansas Infantry, Union. His death in April 18. 1867, would have been two years after the end of the Civil War. His rank as private would have been before 1865.